Being an architect is never easy. The competition is surprisingly huge, and there are great architects everywhere. Hence, you need to stand above the crowd. But how can you build the most innovative design if you’re hunched over your old desk squinting at the details because you don’t own a drafting table? For this post, we have created a list of the best drafting tables that are available in the market today. 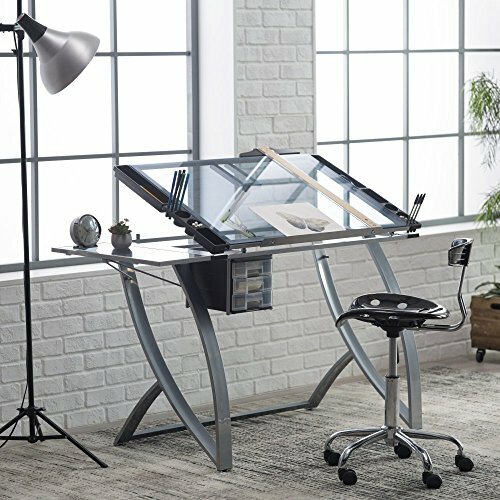 The following top 10 best drafting tables are the most advanced, innovative, and sleek-looking tables that you can be by your side on your way to success. First, we have the avanta draft table from Studio Designs. This sleek-looking draft table features blue tempered glass, and a slid up pencil ledge. It can serve as both drafting and light table according to your needs. You can adjust the top angle for up to 30 degrees, and it even features a storage drawer for your pencils, papers, and other mechanical drafting tools. The drafting table is made of heavy gauge steel construction for added durability. There are also four-floor levelers for great stability while you are working. 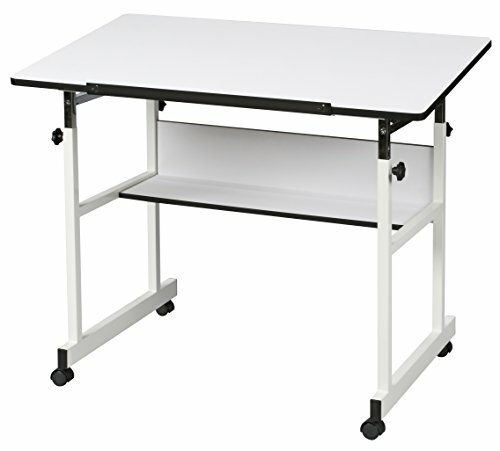 This innovative drafting table also has a bottom shelf for added storage. Rest assured that you can work in comfort and excellent control as you create your next masterpiece. 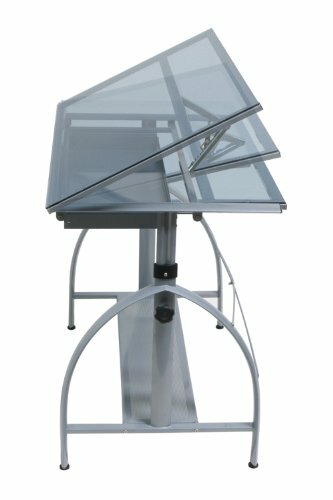 This product is one of the most unique-looking draft tables we have found in the market so far. The height of this table is completely adjustable to provide optimal comfort while you are working. On the right side is your work surface and the lift is the 50-degree tilting work surface that’s much bigger. It also features a smaller top shelf that can hold a variety of mechanical drafting supplies. 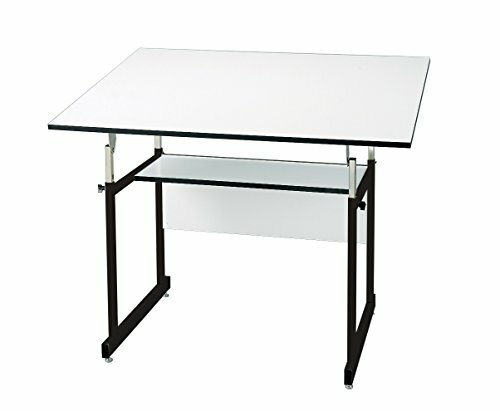 The Safco Products drafting table is made of sturdy steel frame with wood grain melamine top. 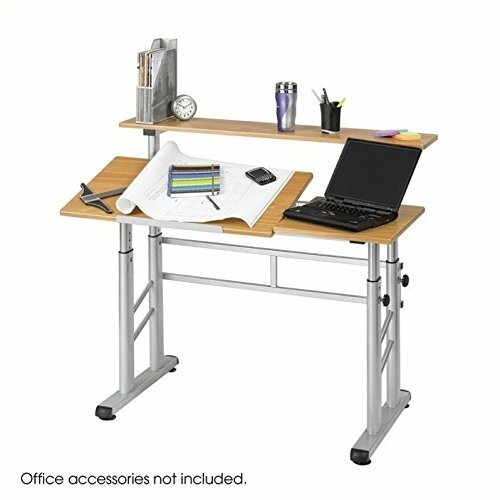 This is the ideal choice for studio, office, or any workspace and the good news is that it doesn’t consume much space. Designed with the hands-on workers in mind, you can either sit or stand while you are working and place your laptop on the right side to keep up with your progress. For those who are looking for the perfect draft table for their office, this is the ideal choice for you. Check out this sleek-looking draft table from Coaster Home Finishing. At first look, it may appear as a part of a piano, but it’s a handy draft table that you can place inside your art studio, bedroom, or working space. It’s finished with black coating and will look great in any modern space. You can adjust the height of the standing desk depending on where you are comfortable the most. It also features a storage compartment underneath the table for your extra tools and equipment. Its angle adjustment contributes to the functionality of the product and can provide optimal comfort to you while working. 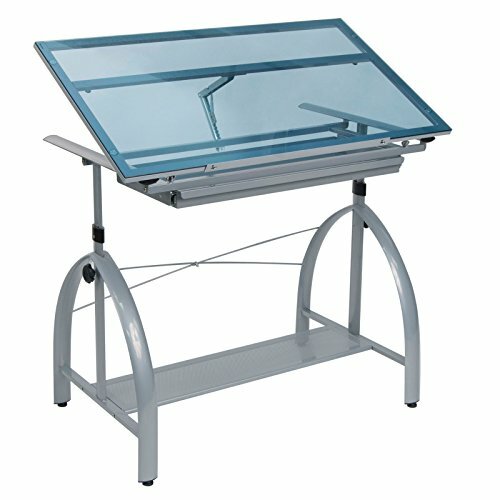 If you are a fan of glass draft tables, check out this product from Studio Designs. This collapsible glass side shelf adds to your convenience while you are working. The frame features a sleek rectangular tubing as your working space. It also features a robust and high-quality tempered blue safety glass worktop surface. You can adjust the angle of the top for up to 35 degrees for your liking. Underneath the table, you can install the plastic three-drawer storage unit, allowing you to place your pencils and smaller tools inside. This table is compatible with parallel bars, and each art tray provides a large compartment. The four-floor levelers will ensure you a stable and even work surface as you use in the in the long run. 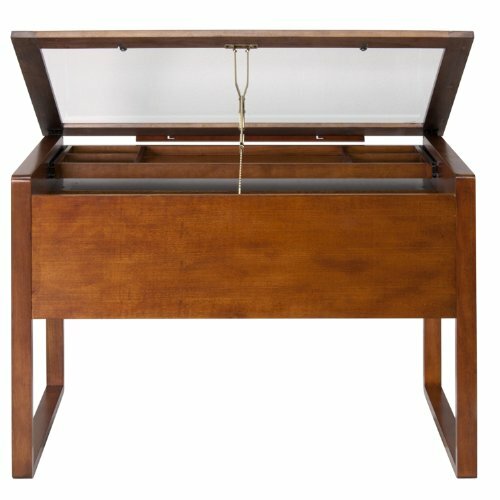 You don’t have to burn a hole in your pocket to enjoy a stable draft table in the comfort of your own home. Next, we have the Alvin drafting table featuring four steel posts for excellent durability. Its sleek white design fits any modern space, and the rounded corners are for the added safety of the user. You can adjust the height for up to 41 inches depending on where you are most comfortable. This table is perfect for all kinds of creative work, and it’s built to last. You can also adjust the board angle from 0 to 30. It’s easy to adjust mechanism is a great deal for beginners or someone who doesn’t want to be disturbed in their work. Buyers can enjoy up to five-year limited warranty upon purchasing the product. 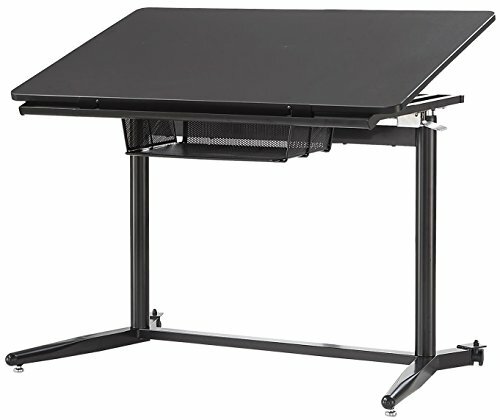 Check out this Avanta drafting table from Offex. It offers a wide surface and adjustable vertical height. You can adjust its top angle from flat up to 30 degrees. 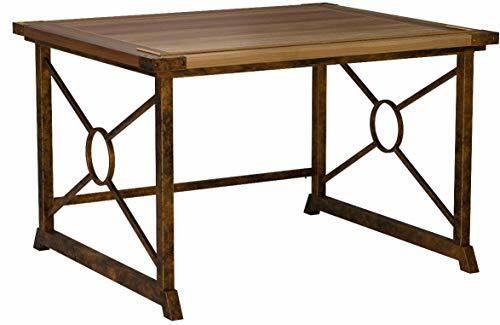 This table is made of heavy gauge steel construction for added durability in the long run. It also has four-floor levelers for excellent stability and a 24-inch pencil ledge that you can slide up and locks into place when you need it. 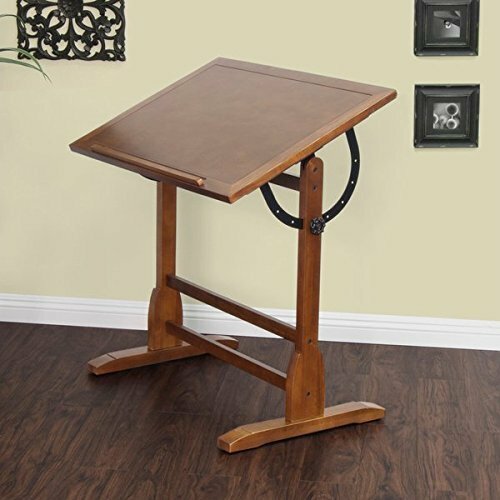 Now you can work all night with this drafting table that will suit all of your needs. Perhaps you are looking for a classic wooden drat table? Introducing another product from Offex is the ponderosa glass-topped table in Sonoma brown color. Similar to the manufacturer’s previous product, it has a wide working space and a tempered safety glass top. There are 8 top angle adjustments from flat to 30 degrees. It also provides a solid wood frame and legs to ensure it doesn’t wobble when you’re using it. The five-partition wooden drawer is perfect for storing your pencils, papers, and other smaller tools for easy access while working. This draft table is supported by thick wooden legs and solid frame. Next, we present the tilt-top drafting table from Upton Home. Still, for customers who are looking for a wooden drafting table, you might want to check this product. It provides ergonomic comfort thanks to its adjustable tabletop that allows you to work with ease for hours. In that way, you can concentrate on your work and not on the pain stabbing your back. Aside from that, this product is made of solid wood with elegant weather oak finish and brass accents, the perfect industrial styles for budding artists. It has an ample working space with a pencil ridge that you can easily convert to a writing table. All you need to do is tilt it downwards, and you’re good to go. Another wooden draft table we’ve included in our list is a product from Studio Designs. Featuring an adjustable angle top from flat to 80 degrees, you will enjoy a comfortable user experience while you are working. Its antique design and finish will look great in any retro-styled house or even a modern space. It also has a built-in 24-inch pencil groove. Although there are no drawers or shelves compared to the previous products we’ve reviewed, rest assured that this is one of the most superior models when it comes to durability and stability. This reminiscent of the turn-of-the-century furnishings is a must have for every novice or professional artists out there. Lastly, we have the Alvin workmaster junior table. Its black base and white top are perfect for any minimalistic and modern room. The table is supported by four thick black posts to ensure stability. It doesn’t wobble a bit compared to other products. Its melamine board is also warp-free, allowing you to create perfection and prioritize the precision of your output. It is made of heavy-gauge steel tubing that is bound to last for a long time. Its melamine board can be adjusted from horizontal to 35 degrees, however you like it. It also features a storage shelf with modesty panels that provides room for all of your supplies and tools while working.